Dandelions grow almost everywhere, in any kind of soil, in most climates. They’re tremendously adaptable and effective at surviving even in bad conditions. And they’re even good for you! Dandelions are really bitter and full of vitamins and other compounds that allegedly support healthy digestion. I’ve been taking dandelion tincture as part of my treatment for Lyme disease for a while now; here’s how you make it! A quick disclaimer: do your own research about whether to use this stuff. I researched it and, on the advice of my medical providers, have been taking it. I’m not going to write much about what dandelions are supposed to do, or why, or what their risks are. This is a ‘how’ article, not a ‘why’. Similarly, make sure you know how to identify dandelions, for sure, before you harvest them. Never eat a wild food without knowing for sure what it is. We’re going to make a whole-herb tincture here, meaning that it involves all the parts of the plant. This recipe is based on folk process herbalism, which you can look up if you’re curious. By ‘tincture‘, we mean that we’re making an ethanol-water extraction of soluble compounds in the herb. There are other terms you can use if you’re interested in the history of herbalism. Gather a bunch of dandelions, being sure to dig up the roots. Many gardeners will thank you for this task and encourage you to return, soon, to clean up their lawns make more medicine for yourself. Remove any slugs, worms, or other animal inhabitants from your dandelions. It’s better if you do this when the dandelions are flowering, so you get some of the petals, but I’m making this batch in September so it’s leaves and roots only. It’s best to gather dandelions that aren’t right next to roads, driveways, or other places with car exhaust. Also, don’t harvest dandelions from a lawn that gets treated with pesticides. You want plain, natural, healthy dandelions. There’s a tradition in herbalism that suggests it’s important to approach these tasks with gratitude in your heart and an awareness that you are asking these plants to die in order to give you greater health. 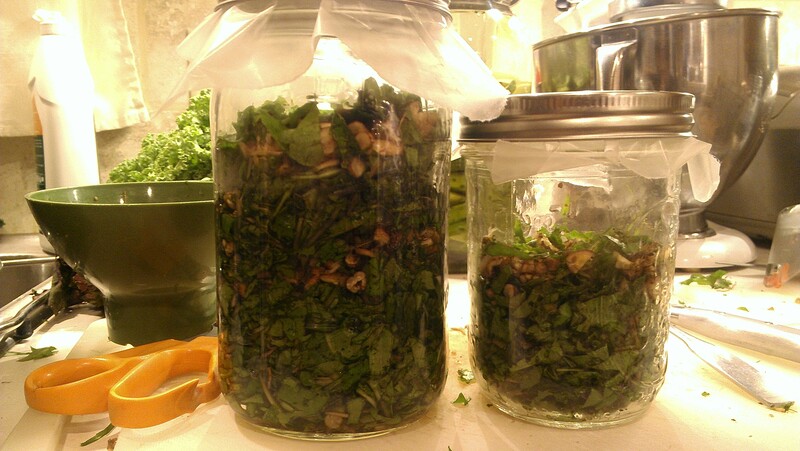 The same tradition says that it’s important to really focus on good health while you’re working on making the tincture. You are, of course, welcome to omit these things if you choose, but I find that they bring some additional meaning into the process and, perhaps, turn the act of making tincture into a meditation on health. I gathered enough dandelions to fill a plastic shopping bag. They were covered with dirt, so my next step was to wash them in several changes of water. It amazed me how many stones and weeds and grains of sand were stuck to my dandelions. 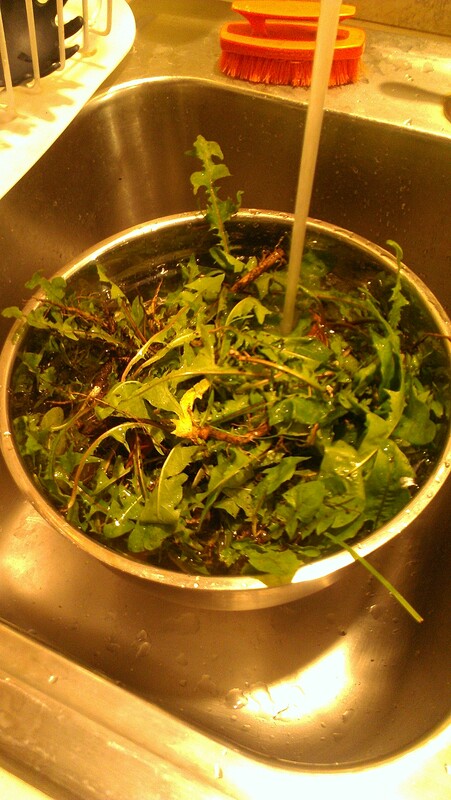 Fill up the bowl and swish the dandelions around for a while. You’ll find the water getting muddy; repeat this process until it’s clear. 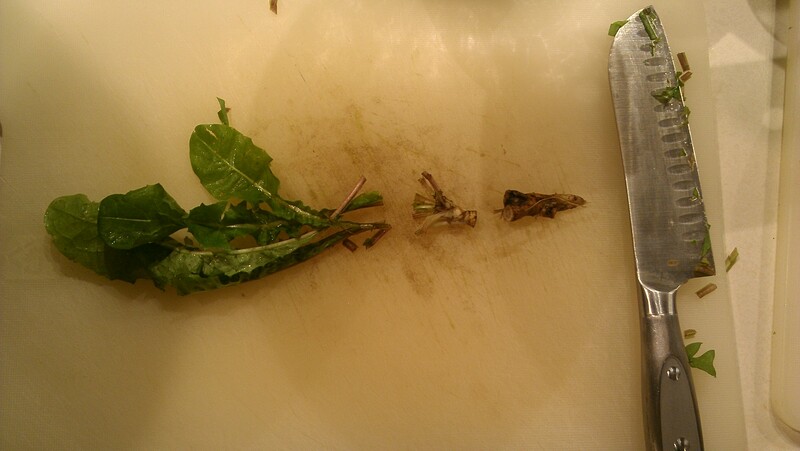 As you do, pick through the dandelions to remove anything that’s not a dandelion: weeds, slugs, dead leaves, etc. Once the dandelions are clean, it’s important to dry them. 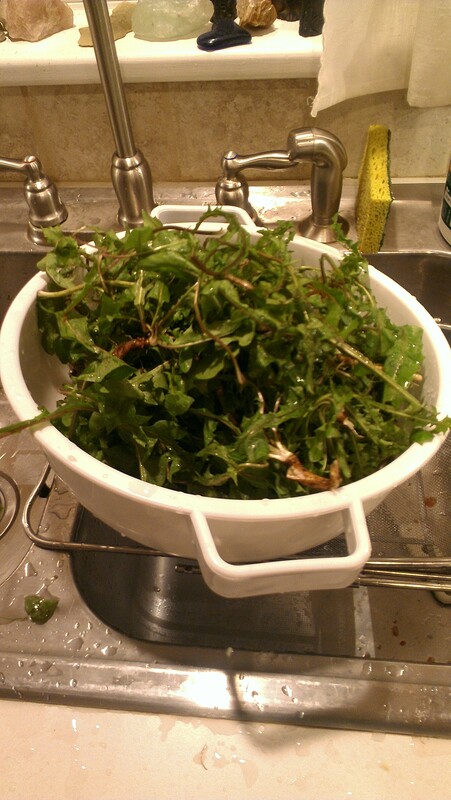 I used a salad spinner, processing the dandelions in several batches. Keep spinning until no more water comes off. Here’s why I think it’s so important to dry them fully. Washed, dried, and looking good! Have you ever heard of a message being ‘garbled’, meaning that it was hard to understand because it had gotten all separated and mixed and chopped up? It turns out that garbling is an herbalism word, too, meaning to separate out the different parts of an herb (dandelion, in this case) and strip away anything that’s not needed. We’re going to keep the leaves and roots of the dandelion (and the flowers and stems, if they were in season), but I like to discard the part that’s sometimes called the nodule. It’s the intersection between the leaves and the root. If you look at my cutting board here, you’ll see that I’ve cut out the nodule; we’ll compost it. From this point, we want to chop the herb into small enough bits that the vodka can do its work extracting the good stuff. There’s no great magic to the approach other than that smaller is better. I’ve read that you shouldn’t use a food processor, though, because the blade tends to heat up the mixture and drive off volatile compounds. 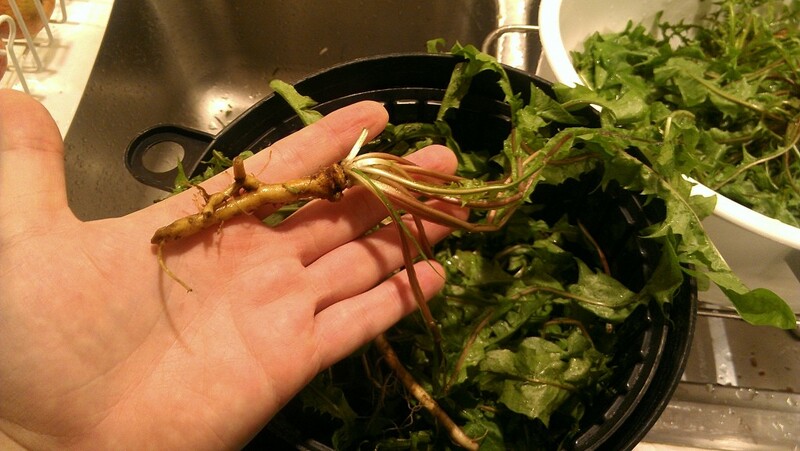 I like to batch process the dandelions to save time: I’ll remove the nodules from about 10 dandelions, then chop their leaves, then chop the roots. I’ve found that if you roll up a bunch of leaves like a cigar, you can easily cut them up using scissors. Once you’ve chopped your dandelions, put them into a glass jar, packing the mixture down with a clean metal spoon. Leave an inch or two of space at the top of the jar. Now it’s time for the vodka. It’s important to use 100 proof (50%) vodka because we want the alcohol concentration to stay high enough to prevent fermentation and rot. Various things I’ve read say the critical number is 37.5% alcohol by volume, and standard vodka (80 proof/40%) is too close for comfort. So spend a little extra and buy the 100 proof. Once your dandelions are packed into the jar, start filling with vodka. Fill it up until you have at least an inch of vodka above the dandelions. Why an inch? Read this. Once you’ve done that, cut a square of waxed paper to fit over the top of the jar, cover with the lid, and screw down the band. Tighten it as much as you can. Then shake the dickens out of it, turning the jar all different ways. Once you’ve done that for a while, open it up and see whether you need to add more vodka to maintain that inch of coverage. Always label your tinctures. Always. If you remember nothing else, remember this. A good label is worth its weight in gold. (Unfortunately labels don’t weigh much, so it wouldn’t actually be worth that much… anyway.) Label the jar, not the lid. The label should clearly state what’s in the jar, when it was made, and what else needs to happen with it. At this stage, I’m just using masking tape since the tincture isn’t finished yet; later on, I’ll probably make nicer labels. 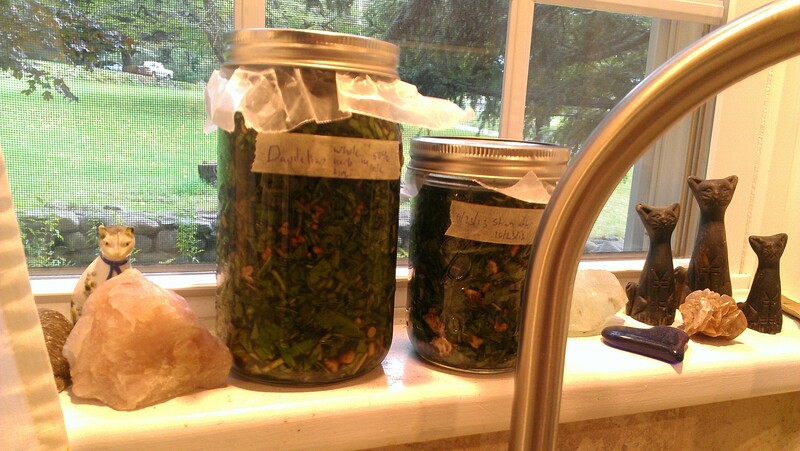 These jars are labeled “Dandelion whole-herb tincture in 50% alc.” and “9/23/13 strain after 10/23/13“. We want these to sit for at least two weeks, and preferably more like four to six weeks, before we strain them. It’s probably better not to leave the tincture jars in direct sunlight long-term, but I find that I forget to shake them unless I’m looking at them every day. Your mileage may vary! Once the tincture is finished extracting, I encourage you to store the bottles in a dark place. Click to see how to finish the tincture once it’s done steeping. Tinctures all bottled, labeled, and ready to use! Made this! Very pleased with the results so far. I picked a lot of dandelions so it filled almost 5 quart jars before being strained. I filled that dark brown eyedropper jar you gave me for us to use and have the extra in mason jars, kept in a cupboard (dark) and refill as needed. Thanks for posting this for future reference! You’re welcome, Alyssa! How’s your supply holding out? Lasting well? My first batch of it started fermenting after a few months in its brown glass bottles. I’m totally mystified; my only guess is that since I was using recycled elderberry syrup bottles, possibly some syrup had gotten stuck under the caps and was providing a fermentation medium. Who knows. Hoping this bath lasts longer! In canada we can’t easily have access to high alcohol content solution. Since Ethanol for wound care in pharmacies (95%) are easily accessible and basically made from grain based alcohol, I’m considering of using it to make my tincture. After the soaking period (2-4 weeks), I can filter the mixture out using a coffee filter, thus taking away potential impurity from this alcohol. What do you think? Is it safe to do so? You need to ask your local pharmacist for advice about that. I would not use the alcohol sold in pharmacies because the stuff in that 5% could potentially blind or kill you. My opinion is that the method you propose is not safe. We have the same vodka problem here in Finland. 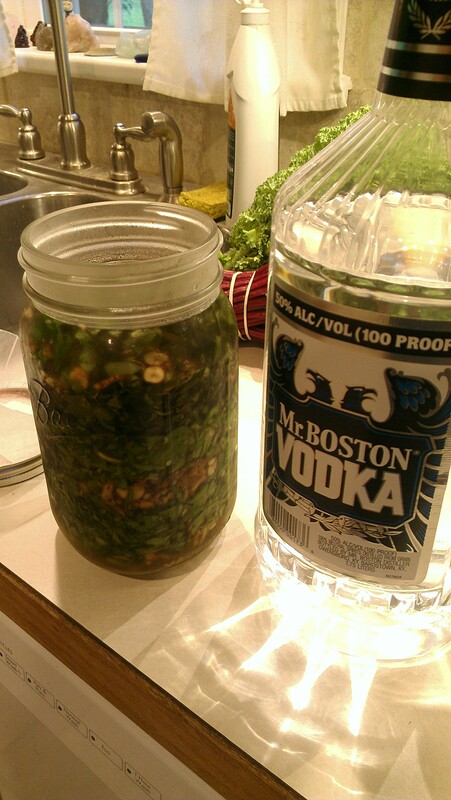 Last summer I made tinctures with 39% vodka, and they were just fine. I didn’t have any problems with them. Only be sure that you use as dry plants as possible, so water won’t do any harm to your tincture. In general, literature recommends not to expose the tincture to the light as it may alter the quality of the product. Also, once the herb is dried out, to accelerate the “cooking” process with alcohol, we also can grind it then add in alcohol, it would take less than 48 hours to extract all the good stuffs from the herb. I was dubious about the alcohol in pharmacies. When calling the hotline, the answer i got was, there are some impurities in the alcohol because the manufacturer usually don’t distill as much time as when they make Vodka. This does not help much. I guess it’s better be safe than sorry. Thank you Hollis Easter. I wouldn’t expose it to sunlight, that breaks down the volatile compounds. That’s why tinctures are sold in tinted bottles. Best to put the steeping tinctures in the back of a cabinet or in a basement somewhere. Good point, Matt. My teacher recommended leaving them in sunlight while still in the “making” stage of the tincture, but then storing them in a dark place, so I’ve updated the article to reflect that. Thanks! Did you allow your dandelions to dry out a couple days before you started your tincture? I was directed to do this before as they carry water and if you don’t allow that water to dry out a little this is how you get tinctures that tend to go bad quickly? 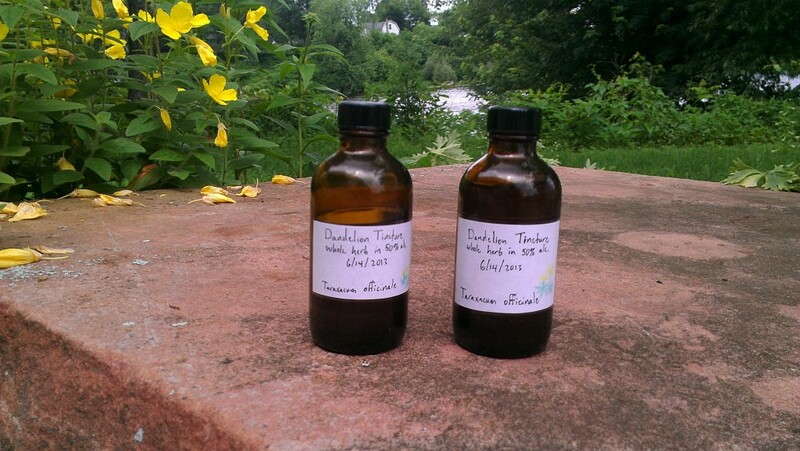 Hi, Sherrie – I’m not Hollis, but I’ve made tinctures both with fresh and dried herbs using 39% vodka from alcohol store. Both ways seemed to work well, but it is more safe to use totally dried herbs, obviously. On the other hand, fresh herbs still have all the good stuff in them. Is there a use for the alcohol soaked dandelions once the tincture has been strained? I haven’t found one so far, Kris. You press them or squeeze them, not just straining, so there’s not much alcohol left in them and they’re pretty mangled and unappealing looking. I just put them in the compost. Can dandelion be mix with nettle ? I never make tincture and I want to begin.I have bought vodka 50% alcohol but I can not find 80% proof on the lebel. Is this good for tincture ? Correct. You need 100 proof, which is 50% ethanol. Hey. Thank you for the post. I have read that autumn is the best time to make root tincture because the Dandelions gather their strength in the roots to survive winter. So they are at their most medicinal state than. So great! Even without petals ! Thanks for this informative website!! No problem. Soil actually has beneficial bacteria in it anyway, but even if there is something wrong, the alcohol will sterilize the contents. Using fresh (instead of dry) root is fine, just use a little more of it- I say with dry roots: half or less of the jar, and fresh roots: 1/2 or a little more of the jar. Then top it off w/ alcohol. thanks so much for your quick reply!!! wow! thanks thanks!!! 🙂 the reciepe I followed said a glass filled up with chopped roots, and then topped with vodka.. So my glass is way more than half full.. but I guess the tincture will just be a bit stronger then? Also, there is a white layer that¨s appeared in the bottom of the glass.. any experience with this? Tincture might be stronger, and that’s starch collecting at the bottom. Harmless. The important thing is the roots remain submerged at all times. I have the same thing happening with the white layer at the bottom. I was going to strain it, as it will be a gift for someone. But i’m not sure if it is ok to sue with that white layer?! Especially since it is for someone else. That’s pretty normal. All these questions get worked out over time; as you get more batches and tinctures under your belt you start to notice the normal levels of variation, and how hard it is to make a tincture the ‘wrong’ way. I like to use brandy instead of vodka, because vodka just tastes so bad, even a few drops at a time. I rinsed the flowers and then covered them with vodka. What will the water do to my tincture? It’ll dilute the alcohol-water ratio, possibly dropping it below the level needed to prevent spoilage. But it might be fine; what proof of vodka did you use? That’s low enough proof that you may have issues–or you might be fine. I’ve just collected some dandelions, unfortunately I was under the impression that the top of the plant rather than the roots is what I was looking for. Is my tincture still going to be effective with the other parts of the plant? Also I gathered yellow and the fuzzy white dandelions, I can use both right?